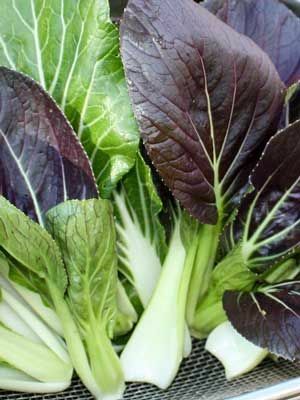 Bok choy can tolerate light frost, but exposure to cold temperatures in spring can trigger early bolting. In autumn, exposure to light frost can improve bok choy's flavor. Mint and Viola. Often grown with lettuce, mustard, kale, escarole, tatsoi, mizuna and other greens found in oriental salad mixtures. Miniature varieties are available for square foot gardens and containers. Sow bok choy in spring and again in late summer for harvest in autumn. Sow in double rows, with rows spaced 10 inches (25 cm) apart. Plant seeds 2 inches (5 cm) apart and barely cover them with soil. Gradually thin to 8 inches (20 cm) apart. Miniature varieties can be grown 3 inches (8 cm) apart. Also spelled pac choi, this lovely little mustard cousin is fast and easy to grow. Pull whole plants for use in the kitchen. Flea beetles often chew small holes in bok choy leaves in spring, but are less of a problem in the fall.